The Airport of the Mauritius is named after the first Prime Minister of the Republic of Mauritius – Sir Seewoosagur Ramgoolam (1900–1985). It is located at Plaine Magnien, in the south east of Mauritius. The distance from the capital Port Louis is about 48 km and 45 minutes’ drive by car. 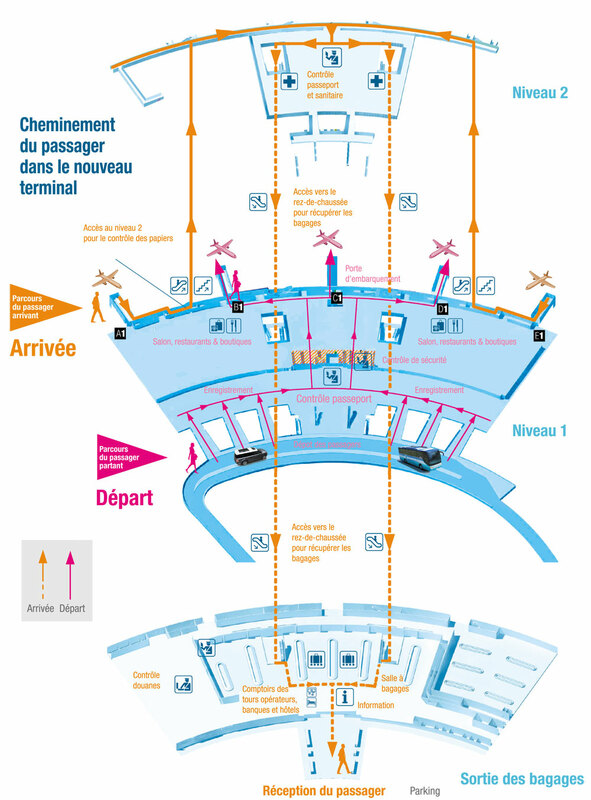 The airport is owned and operated by the government of Mauritius. It serves as the hub of Air Mauritius, the flag carrier airline of Mauritius. The Sir Seewoosagur Ramgoolam International Airport is experiencing a new era since the inauguration of its terminal in September 2013. This high-tech décor hosts an array of modern facilities aiming to improve efficiency and ground service provided to passengers both for departures and arrivals. The terminal displays its 56,900 m2 architecture inspired from the wide fan-like leaf of a ravenala tree. The building, which is managed by ATOL (Airport Terminal Operations Limited), can accommodate 4.5 million passengers a year and has free parking for 600 vehicles. Passengers are welcome in the main hall with its 54 check-in desks, including 25 dedicated to Air Mauritius. Six kiosks have been set up to facilitate on-line check-in for passengers without luggage, while a number of counters greet the premium passengers leaving for various destinations. Immigration formalities have been made much simpler and faster, thanks to more checkpoints upon departure and arrival. The extensive lounge offers some 1,135 comfortable seating as well as fully stocked duty-free shops, two lounges and 700 m2 of restaurant service. Straight after formalities, six conveyor belts cater for efficient delivery of the luggage. 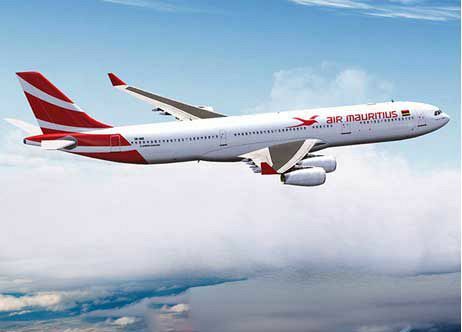 Air Mauritius also welcomes the Business Class passengers and Kestrelflyer Gold members in the luxurious cosiness of the private Amédée Maingard Lounge. Designed on two levels, the Tamarin area on the ground floor and the Chamarel on first floor, both offer a large selection of newspapers and magazines and state-of-the-art amenities, including flat-screen TV with satellite channels, a business corner with high-speed internet connection and free Wi-Fi, the pleasure of international cuisine and the comfort of showers and cloakroom. The lounge also caters for the convenience of passengers with reduced mobility and for families, with baby changing facilities and a kid’s corner. The statistics provided hereunder are to give an insight of the airport business environment, which operates on a 24-hour basis. The figures provided are based on the statistics from the past years. The total number of passengers for the year 2015 has been 3,197,308 which include arrivals, departures and transit. This represents an increase of 9.6% over the year 2014. The passenger increase for the period January - May 2016 over the corresponding period last year is ~10%. With the setting up of the Air Corridor, the consolidation of base markets and the opening of new air services, it is forecasted that the passenger traffic growth will be averaging 5% over the next 5 years. About 1,500 welcomers and well-wishers associated to the passenger traffic transit through the airport daily. More than 4,000 employees commute to and work at the airport daily. Many other stakeholders are operating within the airport area and the new Cargo/Freeport zone due to be operational by August 2016 will bring additional impetus to airport business environment and increase the number of commuters to the airport. Benefit from professional Airport Transfers services for the most attractive rates taking you in maximum comfort from the SSR International airport to your place of accommodation, and later, catering also for your departure transfer. The large fleet of vehicles enables us to offer our clients maximum flexibility in selecting their desired vehicle from comfortable air conditioned family sedans to exclusive VIP vehicles such as Porsche, BMW 7 Series, long stretch limousine and even elite aerial transfer in Helicopter. For groups, we do offer airport transfers in minivans (varies in sized from 7 seaters to 14 seaters), and large minibuses (22 seats and 40 seats). The parking space at the airport can accommodate more than 1,000 vehicles. The parking zone situated in front of the terminal is equipped with trolley shelters and has wide sidewalks which allow pedestrians to have a quick and easy access to the new passenger terminal. Parking zones for licenced and approved Airport taxis, buses and coaches of tour operators as well as car rentals are located near the pick-up area next to the terminal. Accessible parking spaces for the mobility impaired as well as dedicated and well-marked disabled parking spaces located kerbside, are provided as close as possible to the new passenger terminal. Passengers can hire a car on arrival from several car rental agencies represented at the airport. List of car rental agencies operating at the airport: ABC car rental, ADA Co Ltd, Avis, Budget Car Rental, Europcar, First Car rental, SIXT. Seeking a place to relax away from the crowd? ATOL is pleased to welcome passengers with a boarding pass for a departing flight, in its lounge which offers a particularly warm and relaxing atmosphere that invites you to a leisurely break. Passengers can find local and international newspapers and magazines, as well as TV programs, while they continue to check their flight information. A dining area is also available, as well as Wi-Fi internet access, all set in an atmosphere conducive to work or to rest. Located on the left wing of the Boarding area (opposite Boarding Gate 19), the Nénuphar Lounge is open to all passengers irrespective of their airline or class of travel. The comfortable and contemporary surroundings provide a cosy ambiance for relaxation prior to your departure. Passengers can expect a varied snack buffet, an open bar, free Wi-Fi, a wide range of newspapers and magazines, relaxation areas with reclining chairs, showers, baby changing room, local and international TV channels, etc. Passengers may walk in directly and pay for service by cash or credit card (Visa and Master). The Amédée Maingard private lounge is intended for passengers on Air Mauritius and its Codeshare partners, and offers quality services and a relaxing atmosphere to its loyal customers and more demanding passengers. Lost baggage service is operated by the two ground handlers, namely Air Mauritius and Ground2Air. The dedicated counters are located in the baggage reclaim hall. Passengers are advised not to leave their bags unattended. Baggage storage facilities are not available at SSR International Airport. Baggage storage facilities are currently not available at SSR International Airport. Immigration formalities have been made much simpler and faster, thanks to more checkpoints upon departure and arrival. Intending passengers must hold a valid passport for traveling out of, or into, Mauritius. The passport must have a validity of at least 6 months. Foreign Exchange & Banking Services are readily available, both at Arrivals’ exit and Departures Check-In area. All major currencies are accepted by the moneychangers (Shibani Finance, Thomas Cook) and banks (Barclays Bank, Mauritius Commercial Bank, State Bank of Mauritius). ATM (Barclays, HSBC, Mauritius Commercial Bank, State Bank) facilities also exist outside the Arrivals' Hall. Passengers are required to seek endorsement at the VAT Refund (Mauritius Revenue Authority) Counter in the vicinity of Gate 15 in the Check-In Hall B, Level 1. The Mauritius Duty Free Paradise which is engaged in duty free travel retail market, owns and operates all duty free shops, over an area of 2200m2 at SSR International Airport. The Mauritius Duty Free houses a gamut of duty free luxury items, including top brand perfumes, cosmetics, watches, jewellery, liquor, chocolates and cigarettes. The Airport Duty Free also has for sale a wide variety of locally made products like liquor, garments, local tea, and local souvenirs. The prices of the duty free products are reasonable, with that, it is possible to find the same products while traveling in Mauritius for lower prices. The Duty Free Shopping is available on both Arrival and Departure. Inform the Security Officers of your medical conditions, such as a pacemaker that might be affected by the screening process. Passengers having left over belongings in the terminal building are requested to enquire with Airport Customs/Police accordingly. Batteries for wheelchairs and other battery-powered personal mobility aids must meet the airline’s approval and be shown to the screening officer. For more information, kindly consult your airline. Passengers and airport visitors are advised that all threats and comments made about carrying of weapons or explosives may result in rejection to board the aircraft and prosecution. Do not pack sharp objects such as knives, scissors, corkscrews or knitting needles in your hand luggage. Do not carry any LAGs above 100 ml each (liquid, Aerosols and Gels) goods with you or in your bags will be removed by security staff when detected. You are advised to pack your sporting equipment (such as golf clubs, golf balls, snooker cues, fishing rods, etc.) in your hold luggage. Golf balls not allowed in your Cabin Baggage. Address: Sir Seewoosagur Ramgoolam International Airport, Plaine Magnien, Mauritius.